Lebanon Cedars are numerous in France. 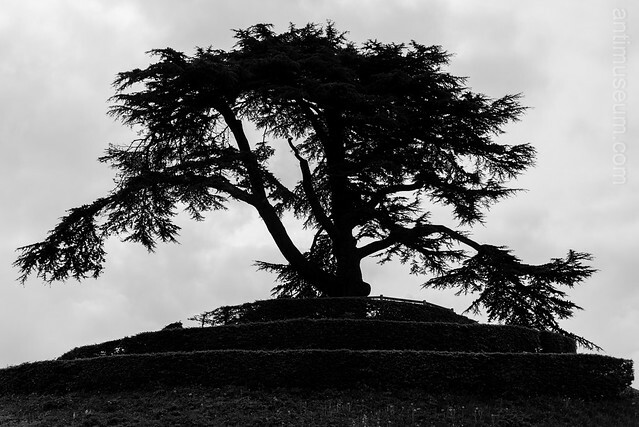 The first Lebanon Cedar was brought to Britain in 1630, France lagged behind and only caught up – literally – with the Joneses in 1764. There is no end to competition between those two countries, in any area. Well, anyway, the result is this: century old Cedar trees like this beautiful specimen in Caen, the City of William the Conqueror, a City once Norman (i.e. Danish), then French, and English, in which the King of England is buried, bombarded, razed to the ground and then liberated by British troops 70 years ago. Entente Cordiale at last. April 2014. There’s a thing that always made me smile from English folks, it’s the emphasis on the fact that it’s not the French who invaded Britain, but the “Danish” or Vikings . When the French king gave the land to Rollo the Viking, it was in 911, under conditions of christianisation and vassality towards the Frankish king . The North Men were not many, and they brought very few, if any, North Women . Between 911 and 1066, 150 years, 6 or 7 generations . What was the remaining percentage of Northern blood in 1066 Normands ? And what about the culture ? They became Christian, they spoke “French” ( a French dialect among the many that were all over the future France ), their Lords had French names : 1057 Robert Guiscard and Roger de Hauteville found the Normand kingdom of Sicilia, 1098 Bohémond de Tarente founds the principality of Antioche not far from Lebanon … Not to mention that together with William’s Normands there were other troops from different parts of France . But well, no English knows that together with Wellington in Waterloo there was Blücher’s Prussian arm, and no English has a clue about the fact that Napoleon’s army had been before that reduced to a little thing by the Russian winter and the Spanish guerrilla . Every English knows Crecy, Poitiers and Azincourt, but none has heard of Patay, Formigny and Castillon, which were though not mere battles among others but the ultimate ones which ended the 100 years war for good . Go on, English tribe . You can fool the whole world, you have done it, but not us . It’s funny how all this medieval jingoistic balderdash is still living on six centuries later, on both sides of the Channel. Let bygones be bygones and let’s celebrate our liberators this year, they deserve it. to access main pages. In addition, the observing surgeons could transmit their comments to the operating surgeon, who could read them on the Google Glass monitor. to 80% loan to value (LTV) with a few banks, with the majority at 75% LTV.